Help & Advice Guides, videos, infographics and more! Doormatic Garage Doors > Blog > Resource Centre > Troubleshooting > 12 Common Garage Door Problems… And How To Solve Them! 12 Common Garage Door Problems… And How To Solve Them! 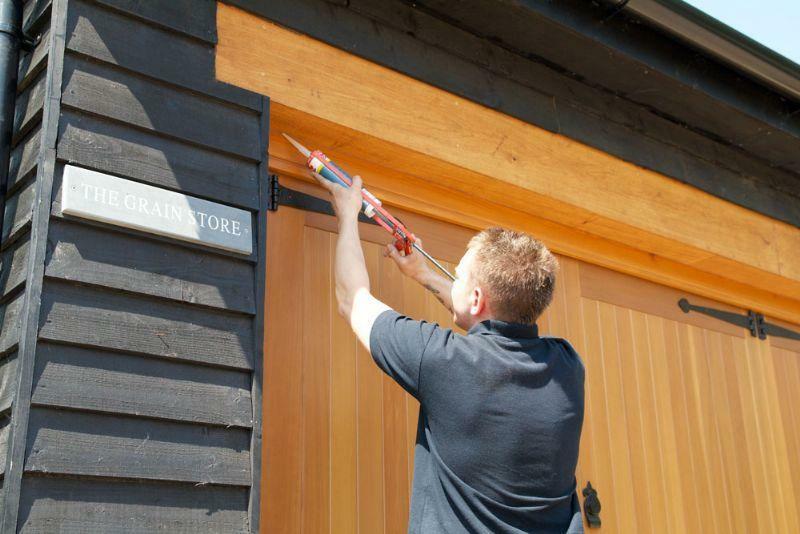 We’re regularly asked to repair or replace garage doors, and very often the problem stems from something that could be avoided through regular maintenance. We’ve put together a top 12 list of the most common garage door problems you may encounter. Throughout the lifespan of your garage doors, rollers are called on to move up and down the track system over a thousand times. Not surprisingly, this can lead to them wearing out. In order to prevent future garage door issues and extremely expensive repairs due to roller breakage, you ideally need to replace your rollers approximately every five years. The garage door will be the largest moving object with the highest traffic area within your home. With family members (and pets!) using it frequently as a main entrance, it can be easy to accidentally cause the safety sensors to move. If you notice that your garage door does not close, the first thing you should check is that the safety sensors are adjusted correctly. For more information on how to fix a garage door that won’t close, look at our guide. Although not all garage door openers need to be lubricated, the ones that do should be maintained every 1-2 years. Other components such as the screw drive operator rails will need to be lubricated on a regular basis. Important – chain and belt drives will never need lubrication, so please keep this in mind even if some garage door repair companies tell you different. Like anything, your garage door motor can lose strength and power. In order to resolve this issue, you can adjust the limit switches on your machine, which are usually located on the side of the motor. Here at Doormatic we cannot stress this enough: lubricating your garage door hinges is a fantastic way to keep them from breaking due to regular use. All you will need to do is to take some lubricant, such as WD-40, and lightly spray them once a year for a smoother and quieter running door – it really is that simple! Check out our garage door maintenance guide for more tips on keeping your door in great condition and preventing issues from occurring. Creaking, squeaking or grinding – if your garage door is making more noise than usual, it may be time to lubricate the moving parts of your garage door, but take care around springs. Other causes of a noisy garage door could be worn rollers or cables that need replacing. A loud bang heard on one occasion, however, is a sign of a broken spring which must be replaced immediately by a professional. Please also see our article on if your garage door too noisy. In cases where the door is having difficulty moving smoothly – or is totally stuck – the issue is often caused by a bent track or a broken moving part e.g. a pulley. Check the wheel tracks for obstructions or debris and remove them. Lack of lubrication may be another reason why your door is sticking, so ensure that your regular maintenance routine includes the application of lubrication to the moving parts. Not only can cracks and splits look unappealing, but they can also affect the weathertight and secure nature of a garage door. Sealants that are showing signs of wear and tear should be replaced, ideally, and cracks in wooden doors can be caulked to restore their quality. In the case of automatic doors, this may be due to issues with your limit switch. If a garage door is hitting the ground, but then reversing back up, check there are no obstructions in the way of the door’s path or obscuring the photo eye sensor. Manual causes can also include broken cables, bent tracks or worn parts – get a professional from Doormatic to diagnose your issue. In our experience, stubborn garage doors that refuse to stay open are often caused by a faulty spring or spring system. Fixing springs is highly dangerous work for untrained individuals – therefore, only fully trained professionals should attempt to rectify spring issues. Does your garage door seem sluggish? It’s often the spring that’s at the root of this issue, but it can also be caused by other elements – therefore it’s always wise to call on garage door specialists, Doormatic, who can diagnose and fix your issue. A fast-closing door is a danger to people, animals and vehicles. Often this issue is caused by a snapped spring or cable, which will need prompt replacement to get the door up and running once more. Read our guide on garage doors not opening or closing for more help with these kinds of issues. At Doormatic, we’re dedicated to providing you with honest, clear and objective advice, so that you can make an informed and stress-free choice that fits your home and family’s needs today – and tomorrow. If the garage door problems you have aren’t covered by the above, we’re here to help! Need assistance? Don’t hesitate to call us on 01483 237393. You can also contact us for a FREE quote here. Doormatic Garage Doors is a registered company in England.